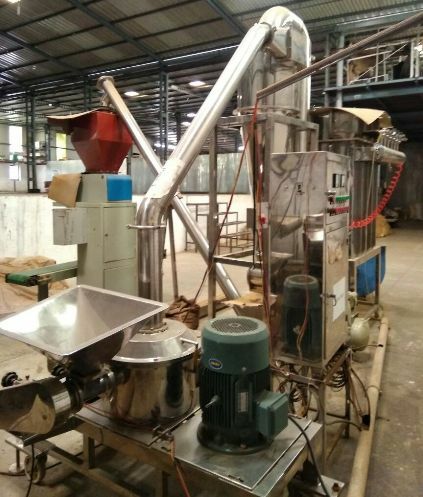 For sale 304 SS pulverizer / turmeric powder grinding machine (dedusting with pulse technology, automatic discharging). Year - 2017. 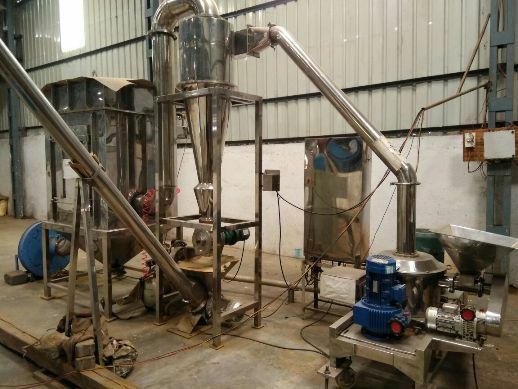 It can grind and mill the dry turmeric slice into 10 - 200 mesh granular and powder grinding motor power: 11 KW / 380. Discharging motor power: 0.37KW. Fan motor power: 7.5 KW. Capacity: 300 - 800 KG per hour (400 KG per hour for 80 mesh). Price - Rs. 10 Lacs. Size of input material: less than 10mm. Size of mesh: 10-200 mesh. Weight: 1500 KG. Dimensions: 5400 x 1300 x 2700 mm.